1 Recommendation is tagged with "recitation"
What are some tips for using PhET in a lab setting? PhET simulations are free, online interactive simulations for teaching and learning science. The simulations emphasize visual models, cause-and-effect relationships, and multiple representations. 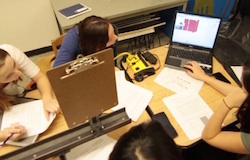 Using PhET in a lab setting has many benefits, such as allowing new possibilities for experiments (such as quantum mechanics), quick repeatability, and making visible the underlying mechanisms.